Sugarplums! When you say the word, doesn’t it conjure up all the traditional stories of Christmas? I’ve never known what “sugarplums” are. I figured they were something like a gumdrop. I believe that’s because – in some of the old Christmas picture books – “sugarplums” are depicted in bright colors, and are sugar-coated, much like gum drops. And so, in our Martin & Sylvia story about “The Nutcracker," there’s a whole-family production of the ballet at Martin and Sylvia’s house. Martin recreates the entire event for his sister, Sylvia, in the funniest and most delightful way! And there are not only SugarPlum Fairies to make the evening complete, but also real sugarplums to enjoy at the end of the performance. This free Martin & Sylvia story — called “Living Room Nutcracker” — is one of our best. It’s absolutely delightful and so funny. Sit together as a family to listen. You’ll be glad you did! Below are recipes for both of the treats that Martin and Sylvia enjoy, so that you can try them along with the story! Who would have thought that “sugarplums” are made of dried fruit and nuts! There’s honey and a little powdered sugar within. And some spices to make them rich and complex. 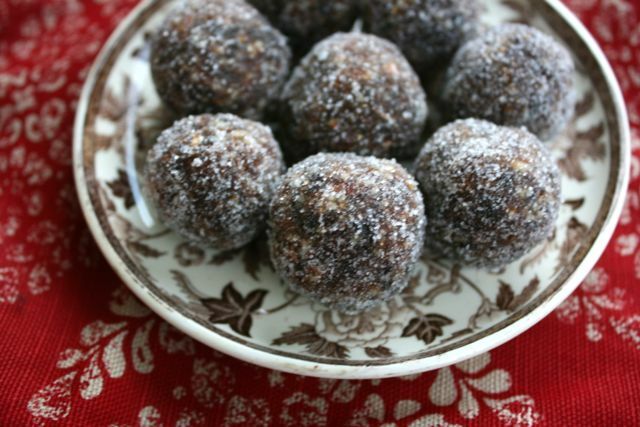 These are sweet and hearty little treats — and between the protein-packed nuts, the nutrient-dense, fiber-rich fruits, and the medicinal qualities of those spices (anise, fennel and caraway are all super for digestion) — I do believe we can say these sweet treats are Good For You! In a medium mixing bowl, combine the anise, fennel and caraway seeds with the cardamom, powdered sugar, and salt. Add the nut and fruit mixture and the honey and mix with your hands until well combined. Scoop a tablespoon of the mixture, and roll it into a ball. Then roll the ball in the coarse sugar and serve. Repeat with the rest of the mixture. Quick note: If you want them to be a little simpler, leave out the seeds. A little cardamom will give a bit of spice, and they’ll be equally as delicious. You know Daddy — he’s always making something creative in the kitchen. And so this is his morning-of-the-Nutcracker recipe for granola — inspired by Sylvia’s “Sugarplum Bunny” — that’s packed with sugarplum ingredients! In a large bowl, thoroughly mix oats, nuts, dried fruit, flour, salt, cardamom and cinnamon. In a 2nd bowl, combine oil, rice syrup, almond milk and vanilla. Slowly add the wet ingredients to the dry, mixing to combine. Line a large baking sheet or shallow baking dish with parchment paper, and spread the mixture in a thin layer. Bake at 300 for 45 minutes to an hour, turning every 15 minutes to ensure an even toasting. Serve with milk and/or yogurt, and a little bit of honey if you want some extra sweet! And then, if you feel inspired, invite everyone into Sugarplum Fairy dance all about the kitchen. It makes the experience particularly magical.